Image Comics is pleased to announce an all-new fantasy adventure from Skottie Young (I HATE FAIRYLAND, Deadpool) and Jorge Corona (NO. 1 WITH A BULLET, Feathers, Big Trouble in Little China: Old Man Jack) and featuring beautifully painted covers by Mike Huddleston—titled MIDDLEWEST. It is set to launch this November. PORTLAND, OR, 7/9/2018 — Image Comics is pleased to announce an all-new fantasy adventure from Skottie Young (I HATE FAIRYLAND, Deadpool) and Jorge Corona (NO. 1 WITH A BULLET, Feathers, Big Trouble in Little China: Old Man Jack) and featuring beautifully painted covers by Mike Huddleston—titled MIDDLEWEST. It is set to launch this November. The lands between the coasts are vast, slow to change, and full of hidden magics. Mistakes have been made, and in MIDDLEWEST, an unwitting adventurer searches for answers to quell a coming storm that knows his name. So begins the epic tale of Abel, a young boy who must navigate an old land in order to reconcile his family's history. Corona added: "Being part of this amazing team is a dream come true, and having Skottie's trust to help him bring this world to life is really a privilege. I just can't wait for everyone else to join us along with Abel as we travel through Middlewest." 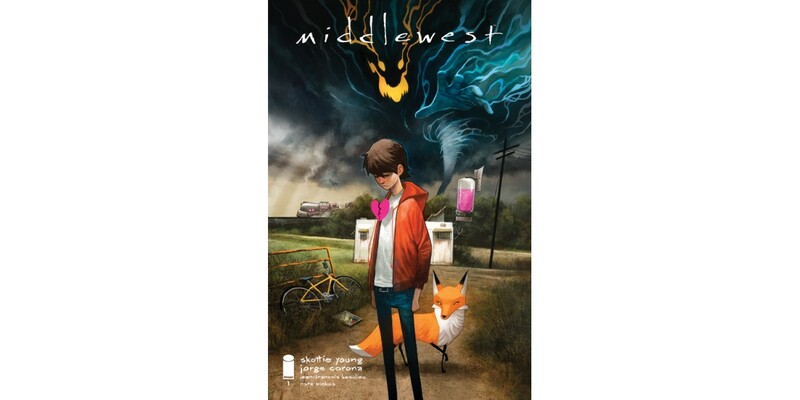 MIDDLEWEST #1 will hit stores on Wednesday, November 21st.